Midsize airlines are posting some of the best results in the airline industry. Last month, they got rewarded for their strong performance with double-digit gains. U.S. airline stocks soared in November, as investors decided that economic growth might increase under the incoming Trump administration. The revelation that Warren Buffett's Berkshire Hathaway had invested in several airline stocks also drove renewed interest in the sector. 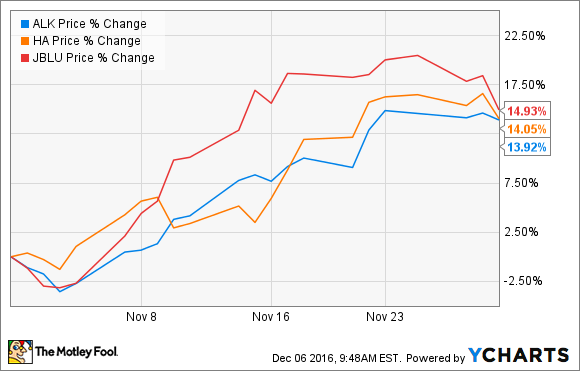 Alaska Air Group, JetBlue Airways, and Hawaiian Holdings November stock performance. Data by YCharts. Aside from the broader election-related market rally, Alaska Air shares surged higher in November based on signs that unit revenue has finally bottomed out. Over the past two years, Alaska has reported a series of steep declines in revenue per available seat mile (RASM). A combination of huge increases in competitive capacity and Alaska's own growth led to oversupply in Seattle, the carrier's main hub market. Last quarter, Alaska's RASM fell 4.4% year over year; on a year-to-date basis, RASM has slumped 5.6%. By contrast, on Nov. 14, Alaska Air revealed that RASM slipped just 1.1% year over year in October. That was particularly impressive because many other airlines said that unit revenue was weak in October due to the timing of various holidays. With competitive capacity growth set to slow dramatically next spring, Alaska's unit revenue could return to growth soon. Additionally, reports indicating that Alaska Air was close to completing its acquisition of Virgin America began to circulate on Nov. 18. The deal wasn't consummated as expected in November, but U.S. regulators approved the merger earlier this month, keeping the companies on track to close by year-end. Alaska Air's acquisition of Virgin America is on track to close soon. Image source: Alaska Airlines. JetBlue also reported a relatively good October unit-revenue result last month. JetBlue estimates that RASM fell 3% year over year in October, including a 2-percentage-point negative impact from Hurricane Matthew, which disrupted Columbus Day weekend travel to and from Florida. This was better than JetBlue's original forecast from late October that RASM could decline by 3.5% to 4% for the month. As was the case for Alaska Air, JetBlue's unit-revenue trajectory has improved dramatically in the past few months. Through the first three quarters of 2016, RASM had declined 6.2% year over year. JetBlue plans to lift unit revenue by adding its Mint premium service to a slew of routes. Image source: JetBlue Airways. JetBlue plans to expand its Mint premium transcontinental service dramatically over the next few quarters. Mint service has driven strong unit-revenue growth on the routes where it has been deployed thus far, so the continued rollout of Mint should provide a nice lift to RASM next year. Unlike Alaska Air and JetBlue Airways, Hawaiian Holdings wasn't hit with big unit-revenue declines earlier this year. Through September, its RASM increased 0.7% year over year. The company expects RASM to continue growing this quarter, driven by rising load factors and strong yields. While Hawaiian Holdings wasn't on Warren Buffett's shopping list, last month it was named a top pick within the airline sector by analysts at Imperial Capital. So far, this title seems well deserved, as Hawaiian significantly boosted its Q4 revenue guidance this week. While the top four U.S. airlines have received the bulk of investor attention lately, midsize carriers like Alaska, JetBlue, and Hawaiian appear to be delivering better results. Hawaiian Airlines has been the only airline to post consistent RASM growth recently, while Alaska Air and JetBlue Airways are both on track to get RASM rising again in the first half of 2017. Furthermore, these midsize airlines trade at a negligible valuation premium over their larger rivals, despite having higher margins and greater growth potential. That's a recipe for continued share-price gains in the years ahead.